200X Advanced Bronzers for a plateau-busting concoction, elevating your bronze to new heights. Black Agave Tequilana Leaf Extract & THC-Free Hemp Seed Oil condition your tan for the darkest and most elusive color. Activated Charcoal helps ensure the finest hue & radiance of bronze. Tan Inc (Brown Sugar) have mixed up a color cocktail never dared before. A Black Agave Tequilana Extract & Hemp infusion will have you daydreaming of high tides & beach vibes. 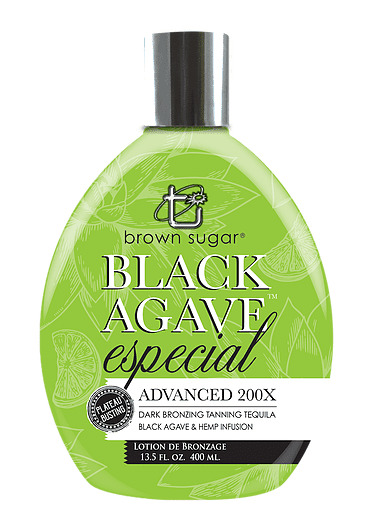 Inspired by the tropical beaches of Cancun, this 200X Bronzing Tanning Tequila is an intoxicatingly dark formula that will bestow your tan with that just-from-the- beach glow.